What are the misspellings for shy? What are the common mistypes for shy? What is the definition of shy? 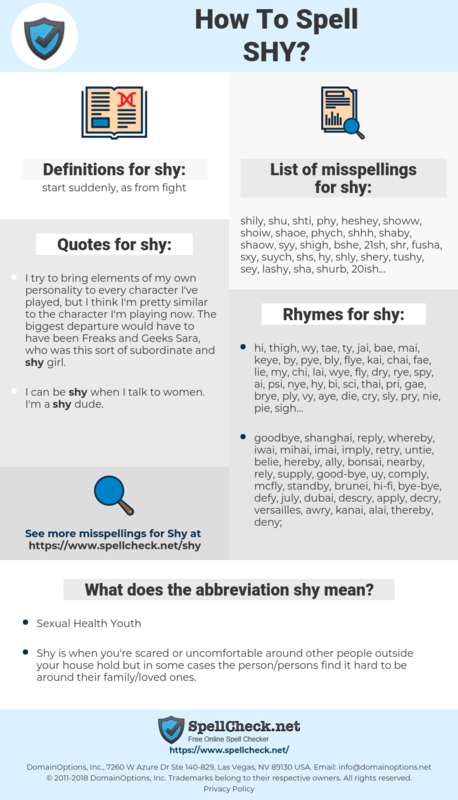 What does the abbreviation shy mean? What are the usage examples for shy? What are the quotes for shy? What are the rhymes for shy? What are the translations for shy? What are the common typos for shy? – Shy is when you're scared or uncomfortable around other people outside your house hold but in some cases the person/persons find it hard to be around their family/loved ones. This graph shows how "shy" have occurred between 1800 and 2008 in a corpus of English books. 害羞, 怯生生, 怯生, 脸薄, 愐, 羞涩, 腼腆的. schuw, schuchter, eenkennig, terughoudend, bedeesd. timide, peureux, craintif, farouche, timides, gênée, gênés. verlegen, zaghaft, Scheu, befangen, schüchtern, genierlich, gehemmt, verschüchtert, kontaktscheu, zag, zage. シャイ, 寡黙, 照れ性, てれしょう, 照れ屋, てれや. frouxo, receoso, tímido, envergonhado, acanhado, retraído, envergonhada, envergonhadas, relutante, hesitante, constrangido, assustadiço, pusilânime, introvertido. reservado, cauteloso, temeroso, tímido, desconfiado, inseguro, reticente, asustadizo, retraído, apocado, cohibido, timorato, esquivo, intimidado, medroso, recatado, pudoroso.